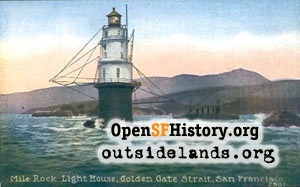 Navigating the Golden Gate with help from an unusual lighthouse. "I couldn't live out there in all that fog." This comment, so often offered when someone found I was a resident of the Avenues used to puzzle me. I thought it wasn't foggy enough. Sure it's often overcast in the Richmond and Sunset, but that isn't real fog. As opposed to the dull slate of overcast skies, fog is a sensual banquet. You can taste fog, feel the wet mist on your skin, see how its cottony skein erases the world halfway down the block. And fog, so silent, is always accompanied here by the doleful bellowing of foghorns. As kids we knew the foghorn variations. We mimicked the cadences and dropped pitches to salute each other. When we got separated in our games in Mountain Lake Park, we found each other in the thickets using foghorn calls. Before 1903, ships were guided into the Golden Gate by bells, cannon fire and, of course, the powerful rays of lighthouses at Alcatraz, Fort Point, Lime Point and Point Bonita. The first fog "horn" for the San Francisco Bay was installed after the Rio de Janeiro didn't hear the bell at Fort Point and crashed on the rocks in 1901. One hundred lives were lost in the worst shipwreck in San Francisco history. The public called for updated equipment and better plans to keep ships safe. 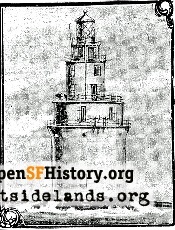 Congress appropriated funds, and part of the new strategy was the construction of a remarkable lighthouse. North of Point Lobos, at the mouth of the bay, are two rocks that peek out of the water, appearing and disappearing with the waves. Here, on the larger of "Mile Rocks," was built what has been called "one of America's greatest engineering accomplishments." Erected by sailors recruited from the waterfront (because regular construction workers refused, fearing for their safety), the lighthouse was built in rough seas on a small barnacle-encrusted rock just forty feet long and thirty feet wide. The workers arrived at the job by jumping from a small boat and often ended up in the water soaked to the skin. 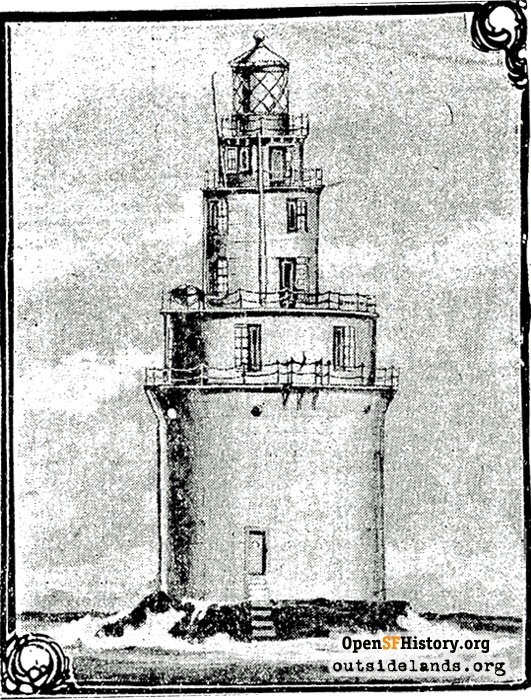 The slender tower, telescoping in smaller white cylinders for three levels and topped by a black lantern room, housed a horn, whistle, and a 4'8" lens sending warning to all vessels entering the Gate. Ralph and Lisa Woo Shanks, in their book Guardians of the Golden Gate did an excellent job describing the difficult lives of the "wickies" who manned the lonely outpost. While tantalizingly close to the city, the keepers lived confined, isolated days and nights. The station was too small for family. The four-man crew lived in close quarters with limited recreational opportunities. Just getting to the beacon involved maneuvering a small boat, sometimes in the midst of 15-foot swells, under a lighthouse boom to scale a rope ladder. Not surprisingly, one of the hardest things to get used to working at Mile Rock was the regular oppressive blast of the fog signal. At the end of El Camino del Mar, a small road just east of Sutro Heights, you can see Mile Rock now. If the fog isn't in. At the viewpoint the Park Service has installed an informational sign titled "Shipwrecks." Here is ample justification for the lighthouses, for foghorns. At low tide appear the remains of the Frank H. Buck and the Lyman Stewart, oil tankers that wrecked on the rocks here in the 1920s and 30s. But you won't see the white 85-foot tower at Mile Rock anymore. In the 1960s the Coast Guard dismantled the top half of the sentinel, creating a helipad, and automated the station's light and signal. Now Mile Rock looks like a stubby striped mushroom, as elegant as a mayonnaise jar. Ending another tradition, the Coast Guard stopped the distinctive foghorns in 1992, replacing them with electronic signals. Protests from romantics all over San Francisco brought some of the horns back. The fog doesn't care one way or another. Lighthouses, foghorns, wrecked ships, and hooting kids won't stop its return. If you don't like it, you'd better move to the Mission District. Bibliography: Guardians of the Golden Gate, Ralph Shanks and Lisa Woo Shanks, 1990; San Francisco Secrets, John Snyder, 1999; San Francisco Chronicle, March 24, 1904. Page launched 13 January 2002; updated 3 October 2008.